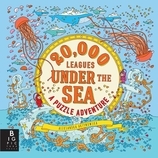 Inspired by Jules Verne’s iconic novel, this puzzle book is a treat for readers of all ages. Aleksandra Artymowska has created a volume bursting with wild creatures, strange landscapes, and mechanical contraptions that will take readers on an underwater adventure like no other. Each scene contains hidden symbols and keys to uncover, as well as a series of challenges guaranteed to fascinate and amaze. 96 / 11 7/16" x 11 7/16"
Aleksandra Artymowska is an illustrator, graphic designer, and painter from Poland. She graduated from the Academy of Fine Arts in Warsaw in 2005. She now splits her time between Warsaw and Beijing.